County Chairwoman Phyllis Randall, left, and Supervisor Koran Saines, right, join the crowd in taking photos of the new historical marker highlighting the significance of the Belmont Chapel and its founder Margaret Mercer. 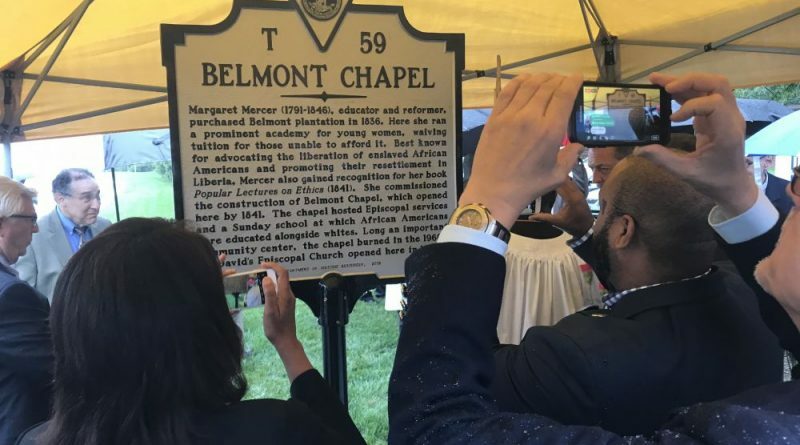 Loudoun’s newest historical marker, highlighting the significance of the Belmont Chapel in Ashburn, was formally unveiled during a ceremony at St. David’s Episcopal Church and School on Sunday. The event was a celebration of the life of Margaret Mercer, the progressive educator and abolitionist who built the church in 1841. Speakers highlighted Mercer’s opposition to slavery, efforts to resettle freed Africans in Liberia, and her bold, even lawbreaking commitment to educate the children of slaves. Mercer, the daughter John Francis Mercer, a Maryland governor who also represented Virginia in the Continental Congress, purchased the 400-acre Belmont Plantation from the Ludwell Lee family in 1836. She established a boarding school, using the tuition from families who could afford to pay to attend the school to educate those who could not. In addition to freeing the slaves she inherited from her father, Mercer was a founder of the African Resettlement movement. 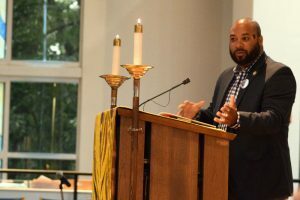 Those ties with Liberia remain today, as the congregation of St. David’s Episcopal Church, which was established at Belmont in 1990, supports a school in the west African nation. U.S. Rep. Barbara Comstock (R-VA-10) said Mercer’s life set an example for women to follow today. 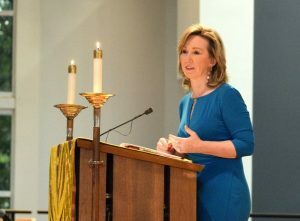 U.S. Rep. Barbara Comstock speaks at St. David’s Episcopal Church and School in Ashburn during the Belmont Chapel historical marker dedication ceremony. Loudoun County Chairwoman Phyliss J. Randall (D-At Large) pointed to Mercer’s decision to free her family’s slaves as a remarkable defiance of her father, who believed that slavery was ordained by God. Her commitment to educate the children of slaves—at a time in Virginia when it was illegal to teach black people to read or write—was courageous. “Her most important legacy was courage. She had such remarkable courage,” Randall said, adding that Mercer set a moral example that should provide inspiration for residents today. Supervisor Koran Saines speaks at St. David’s Episcopal Church and School in Ashburn during the Belmont Chapel historical marker dedication ceremony. ties to Mercer and St. David’s Church. He said that family research has documented that his ancestors—four brothers who were free tradesmen—were among the first to be transported to Liberia as part of the resettlement movement Mercer had championed. Also, Saines said his grandmother had attended the Bromley Missionboarding school that is supported today by the St. David’s congregation. He thanked the church for its continued support of the country, including sending extra supplies in times of crisis. Minister Gabriel I.H. Williams of the Liberian Embassy also celebrated Mercer’s efforts. “She educated boys and girls from all walks of life—slaves or free. Margaret Mercer worked for freedom and dignity for all people,” he said. He highlighted the continuing close connections between Virginia and Liberia and he urged them to be strengthened by investments that would help build the nation’s industries, including fisheries, tourism and agriculture. While there are many schools to support by providing books and other resources, Williams said there were other ways to help Liberia. “We are not just looking for handouts. We need investment. We need opportunities,” he said. Margaret Mercer (1791-1846), educator and reformer, purchased Belmont plantation in 1836. Here she ran a prominent academy for young women, waiving tuition for those unable to afford it. Best known for advocating the liberation of enslaved African Americans and promoting their resettlement in Liberia, Mercer also gained recognition for her book Popular Lectures on Ethics (1841). She commissioned the construction of Belmont Chapel, which opened here by 1841. 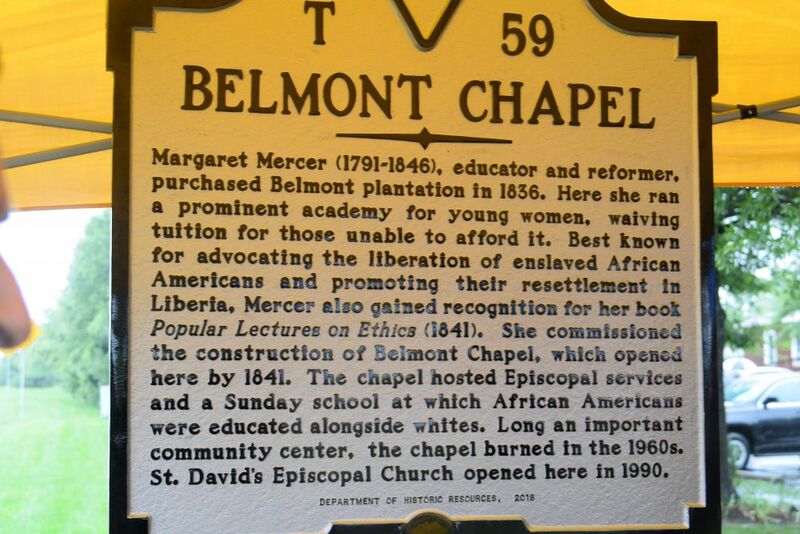 The chapel hosted Episcopal services and a Sunday school at which African Americans were educated alongside whites. Long an important community center, the chapel burned in the 1960s. St. David’s Episcopal Church opened here in 1990. From left, Margaret Mercer (portrayed by Diva Lynch), Rev. 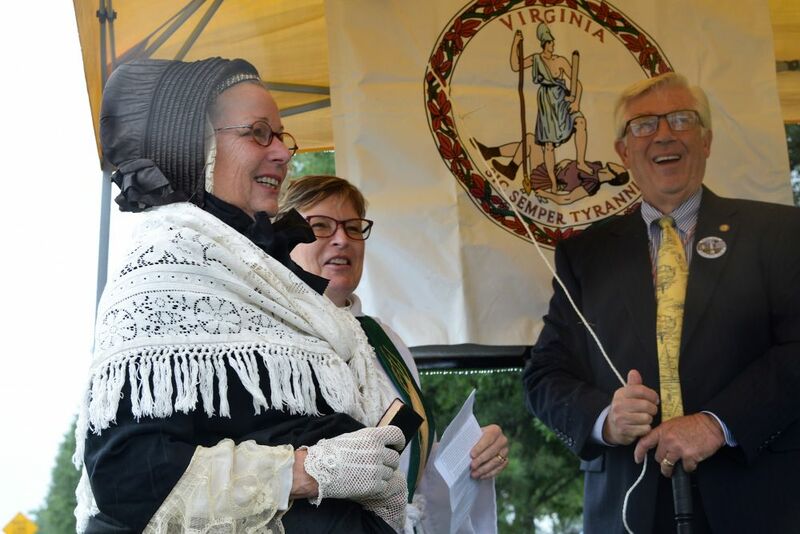 Mary Kay Brown and Clyde Smith of the Virginia Department of Historic Resources prepare to unveil Loudoun’s newest historical marker during an Sept. 9 ceremony.